We deal in a wide variety of evening bags that are carved in perfectly tanned leather for keeping a medley of cosmetics. Offered in several sizes, as per the requirement and convenience, these bags are widely appreciated by our clients for their unblemished quality. 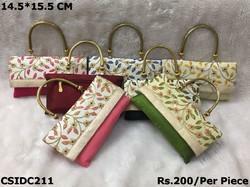 Size: L 10" * H 6"
Designer Clutch Bags For Party, Wedding, Gift Etc. 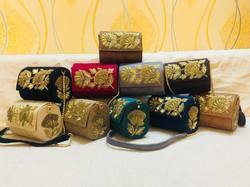 Brocade bags , banarasi bags with stone work , traditional jamevaar fabric embroidered envelop bags, indian traditional envelop sling bags.